nice car. what size engine is that? From the photos at least, looks like a terrific find. Appears to be a very straight body. Nice to know you can still find one! John I need to come by and see that baby!! You still have the 390 though right? You mentioned drivetrain plans... what about paint? What you dont like Lime Gold ? I dont have anything going on saturday morning. Nice find! I have to agree with the logic as well. I know I'll never be able to aford a Real Shelby, and I would be afraid to cruise in a $200k car as well. I have a red 67 convertible I got from the original owner. It's got more rust but at least no accidents in it's past. I debated restore or clone. 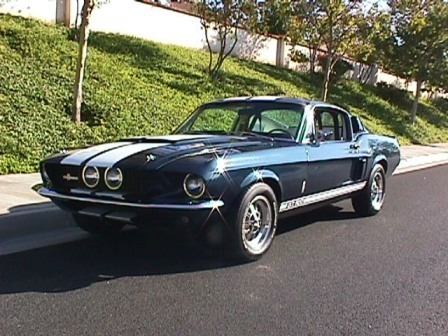 After talking to a couple of Mustang owners at a recent car show, I had to agree... build the car you really want! There's no reason to restore unless it's really rare. Then drive all you want! That's what they were made for right!?! Not to hijack the thread...but since you've probably already done the research; What is considered the "Best" suspension setup for a 67 restoMod. I want to attempt this as well. I want a street driven car that I can take to a road course 1 or 2 times a year without compromising with cutting the body and keeping a relatively stock appearance. So far I've read good things about Total Contol Products and Griggs GR-350. Any reccommendations one way or the other? Or any other recommendations I missed? I found a 67' in McAllen , TX with very little rust. The car was delievered this past week. Hey John, I searched but can't find the No way thread. Can you give me a link so I'm up to speed. Terry , I envy your 70' Vert !!! Wow, that car is clean. What suspension are you going to run? The wife and I saw your car at SVPU Pauls when we were there getting the wheels for her car. Nice find. Take real good care of her! I'm very sorry about your loss. I wish there was something I could do to help. Thank you, I had a Marti report done on it and it came back as a 1 of 2 car. It's supposed to be medium lime green metallic. I like the green on your car but the medium Lime on my car was ugly. I'm curious how the cowel comes off like that. I redid my 65 quite a few years back and didn't see anyway other then cutting to get it off. Was it bolted in or did you have to cut it off and reweld it later?